Guru Rinpoche (Precious Master) is the father of the Drukpa Kagyu school of Tantric Mahayana Buddhism practiced in Bhutan. Standring Ngawang Namgyal, a Tibetan lama of the Drukpa School, arrived in Bhutan in 1616. He introduced the present dual system of religious and secular government, creating and building the system of Dzongs throughout Bhutan. Shabdrung unified the country and established himself as the country's supreme leader and vested civil power in a high officer known as the Druk Desi. Religious affairs were charged to another leader, the Je Khenpo (Chief Abbot of Bhutan). For two centuries following Shabdrungs demise, civil wars intermittently broke out, and the regional penlops (governors) became increasingly more powerful. This ended when an assembly of representatives from the monastic community, civil servants and the people, elected the Penlop of Trongsa, Ugen Wangchuck, the First King of Bhutan in 1907. The monarchy has thrived ever since, and the present king, His Majesty Jigme Singye Wangchuck, fourth in line, commands overwhelming support for his people. The Kingdom of Bhutan lies in the eastern Himalayas, between Tibet to the north and the Indian territories of Assam and West Bengal to the south. The Kingdom has a total area of about 47,000 square kilometers. Located in the heart of the high Himalayan mountain range, Bhutan is a land-locked country surrounded by mountains. The sparsely populated Greater Himalayas bounded to the north by the Tibetan plateau, reach heights of over 7,300 meters, and extend southward losing height, to form the fertile valleys of the Lesser Himalayas divided by the Wang, Sunkosh, Trongsa and Manas Rivers. Monsoon influences promote dense forestation in this region and alpine growth at higher altitudes. The cultivated central uplands and Himalayan foothills support the majority of the population. 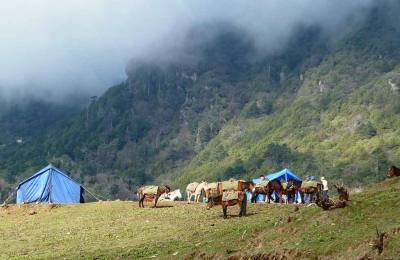 In the south, the Daurs Plain drops sharply away from the Himalayas into the large tracts of semi-tropical forest, savannah grassland, and bamboo jungle. Early records suggest scattered clusters of inhabitants had already settled in Bhutan when the first recorded settlers arrived 1,400 years ago. Bhutan indigenous population is the Drukpa. Three main ethnic groups, the Sharchops, Ngalops and the Lhotsampas (of Nepalese origin), make up today's Drukpa population. Bhutan's earliest residents, the Sharchops reside predominantly in eastern Bhutan. Their origin can be traced to the tribes of northern Burma and northeast India. The Ngalops migrated from the Tibetan plains and are the importers of Buddhism to the kingdom. Most of the Lhotsampas migrated to the southern plains in search of agricultural land and work in the early 20th century. Bhutan's official language is Dzongkha. Given the geographic isolation of many of Bhutan's highland villages, it is not surprising that a number of different dialects have survived. Bhutan has never had a rigid class system. Social and educational opportunities are not affected by rank or by birth. Bhutanese women enjoy equal rights with men in every respect. To keep the traditional culture alive Bhutanese people wear traditional clothing that has been worn for centuries. Bhutanese men wear ago, a long robe tied around the waist by a belt. The women's ankle length dress is called a Kira, made from beautifully colored and finely woven fabrics with traditional patterns. Necklaces are fashioned from corals, pearls, turquoise, and the precious agate zee stones which the Bhutanese call tears of the gods. While urban settlements have sprung up with the process of modernization, the majority of Bhutanese people still live in small rural villages. The Bhutanese diet is rich in meat, dairy, grain (particularly rice) and vegetables. Emadatse, the dish made of chili, cottage cheese, and herbs) is considered, unofficially, the national dish with many interpretations to this recipe throughout the country. Meat dishes, mainly pork, beef, and yak, are lavishly spiced with chilies, and it is common to see bright red peppers drying on rooftops in the sun. Salted butter tea, or sugar, is served on all social occasions. Chang, a local beer, and area, a spirit distilled from rice, maize, wheat or barley, are also common and widely favored. Doma or betel nut is offered as a customary gesture of greeting. The Bhutanese way of life is greatly influenced by religion. People circumambulating the chores with prayer beads and twirling prayer wheels are a common sight. Every Bhutanese home has a special room used for prayers - a chose. The form of government in Bhutan is as unique as the country. It is the only Democratic Theocracy in the world. His Majesty King Jigme Singye Wangchuck is Bhutan's fourth king. A very special man who has endeavored to keep the culture and traditions of his county intact while listening to the voice of his people. As one of the six goals of development of The Royal Government of Bhutan is peoples participation and decentralization of the government. Bhutan is divided into 20 dzongkhags, or districts, each with its own representative elected every 3 years. The Tshogdu or National Assembly has 154 members who fall into 3 categories. The largest group with 105 members are the Chimis. Representatives of Bhutan's 20 dzongkhags. The regional monk bodies elect 12 monastic representatives who also serve a 3-year term. Another 37 representatives are civil servants nominated by the king. They include 20 Dzongdas, (district officers or mayors), ministers, secretaries of various government, and other high ranking officials. The National Assembly meets in Thimpu once each year. The Royal Government of Bhutan recognizes that tourism is a worldwide phenomenon and an important means of achieving socioeconomic development particularly for developing countries like Bhutan. It also recognizes that tourism, in affording the opportunity to travel, can help in promoting understanding among peoples and building closer ties of friendship based on appreciation and respect for different cultures and lifestyles. There are, however, problems associated with tourism which, if not controlled, can have a devastating and irreversible impact on the local environment, culture, and identity of the people. Realizing these problems and the fact that the resources on which tourism is based are limited, the tourism industry in Bhutan is founded on the principle of sustainability, meaning that tourism must be environmentally and ecologically friendly, socially and culturally acceptable and economically viable. The number of tourists visiting Bhutan is regulated to a manageable level because of the lack of infrastructure. Towards achieving this objective, the Royal Government, since the inception of tourism in the year 1974, has adopted a very cautious approach to growth and development of the tourism industry in Bhutan. In order to minimize the problems, the number of tourists has been maintained at a manageable level and this control on the number is exercised through a policy of government regulated tourist tariff and a set of administrative requirements explained in the following Sections. Tourism in Bhutan was privatized by the Royal Government of Bhutan in 1991. Today it is a vibrant business with 33 private operators at the helm of affairs. 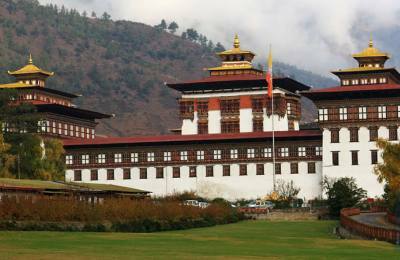 The Royal Government of Bhutan adheres strongly to a policy of low volume, high-value tourism.